The theme for this month's Mixology Monday (MxMo CI) was picked by DJ Hawaiian Shirt of the Spirited Remix blog. The theme he chose was "Orange Juice," and he elaborated on his choice with his description of, "It really irritates me when people dismiss an ingredient. Whether it's too ordinary, or difficult, or inconsistent, or overpowering, I can't help but feel such conclusions are lazy and defeatist. Your theme this month is 'Orange Juice,' an ingredient I too often see derided or ignored when it comes to thoughtful mixology. Surely an assembly of such mixological brawn as MxMo can find or create a delicious way to mix OJ, right?" In discussing this with DJ, I pointed out that there was an early MxMo with an Zodiac tie-in orange theme, but how I understood how certain drinks like the Olympic were horrible. And I recalled conversations with John Gertsen about how orange juice made Boston's Ward Eight uninspiring which is why he frequently opts for orange bitters instead. Therefore, I agreed it was something that ought to be addressed despite some overlap in theme. Afterwards, I realized that the Satan's Whiskers, Monkey Gland, and Tiki drinks like the Fog Cutter all shine with orange juice's smoothing character. Moreover, orange juice perhaps is the key ingredient that saves the Blood and Sand from being a hot mess. But on the other side of things, there is the abomination that is the Tequila Sunrise that is only a joy to make since it allows me to sink grenadine at the bottom of a Highball glass. For inspiration as to an orange juice recipe, I turned to Imbibe Magazine and their online database. There, I found the Luau Daiquiri that is served at Beachbum Berry's Latitude 29. Given that there are recipes named after the Luau Room in Berry's books, I cannot discern if this was their original recipe or merely one they provided. Regardless, about a fifth of this drink was orange juice which should allow the ingredient to shine through. Shake with ice and strain into a coupe glass. Garnish with an edible orchid (lime wheel). 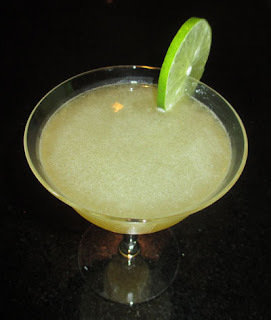 The Luau Daiquiri began with a lime oil aroma over the rum's funk. Lime and orange paired up on the sip that led into a funky rum swallow with a vanilla finish. Indeed, the orange gave a smoothness and tropicalness to the flavor profile. However, it needed to be paired with lime juice to give the body any structure; this of course will not the case when bitter oranges such as Seville are available for a short window in January. Moreover, without the orange juice, the Luau Daiquiri would have come across like a less spiced Winter Daiquiri. Thanks to DJ Hawaiian Shirt for hosting Mixology Monday again and allowing us to shine a spotlight on ways orange juice can function to make drinks more distinctive instead of masking flavors and flaws. And thanks to all of the MxMo participants for getting out the juicers and keeping this event going month after glorious month. Cheers! Thanks for posting, brother! This drink reminds me a lot of the Derby Daiquiri from the Grog Log, and so I'm sure it's balanced and delicious. Exactly the kind of thing I was hoping for.